We use this material to achieve a hydrocarbon-free vacuum and in our glovebox to remove H2O. It can be regenerated at temperatures from 150 - 200 deg. 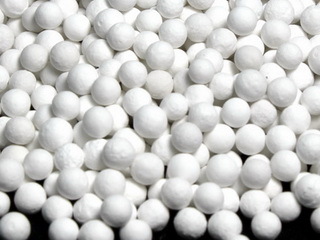 C.
highly porous, spherical shaped Aluminum oxide with a high specific surface und high mechanical stability; it does not decompose in water. In comparison with Silicagel, Activated Aluminum oxid has a higher adsorption capacity for water at higher temperatures.